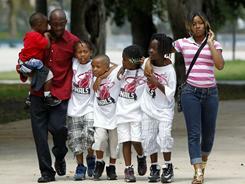 By Eliot J. Schechter for USA TODAYJames Howard and his six kids in Miami. His wife Kellee Lee-Howard died last year. Reached at his office, Sant Antonio said he was “not at liberty to talk about the case.” His attorneys did not return phone calls, but in July they filed a motion seeking to dismiss the case or require the Howard family’s attorney to specify how Sant Antonio was negligent. RESPONSE: Read the response from Alyne Medical Rejuvenation Institute and Alberto Sant Antonio, M.D. Sant Antonio is one of a soaring number of doctors who trained in other medical specialties, such as vision or obstetrics, but have branched into the more lucrative field of cosmetic surgery. Because state laws governing office-based surgeries often are lax, levels of training vary so widely that some doctors are performing cosmetic procedures after only a weekend observing other doctors. Sant Antonio himself has offered three-day liposuction training at his office for the last few years, according to interviews with doctors who have trained under him. Some dentists trained in oral surgery now do breast implants; OB/GYNs perform tummy tucks, and radiologists are doing liposuction. The results can be disastrous, according to interviews with scores of victims, plaintiffs’ lawyers and plastic surgeons, and a review of lawsuits. Even so, there’s no shortage of patients: An aging — and often overweight — population is willing to spend money on cosmetic procedures, and people often are seeking lower-cost options to board-certified, sometimes higher-priced plastic surgeons. Lee-Howard was not the only one to die after surgery at Sant Antonio’s clinic. A housekeeper and mother of two, Maria Shortall, 38, died of cardiac arrest after a liposuction and a fat-transfer procedure performed by Sant Antonio in June, according to the Florida Department of Health. Sant Antonio studied pediatrics briefly before completing a medical residency in general surgery. Although he was never board-certified in any area of medicine, he was able to work as a general surgeon at a Baltimore hospital before moving to the Miami area after settling a medical malpractice claim in 2004, according to Franklin Square Hospital and Florida Board of Medicine records. Franklin Square now requires its doctors to be board-certified. Sant Antonio “fills a niche in the market offering discounted surgery,” says Gallerani, who says he sees up to five patients a week whose surgeries were botched by non-plastic-surgeons. Rohie Kah-Orukotan, in nearby Weston, also died after liposuction by a doctor who wasn’t a plastic surgeon. Florida health officials alleged that Omar Brito — whose training was in occupational health — was doing cosmetic surgery without enough training or the proper equipment, according to state medical board records, which show he surrendered his license. 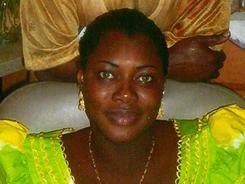 Rohie Kah-Orukotan died after having liposuction. Weston MedSpa, where Kah-Orukotan got manicures and the liposuction procedure that led to her death, wasn’t approved for office surgery, according to Florida Health Department records. Kah-Orukotan, 37, was rushed to the hospital and taken off life support about a week later, says lawyer Michael Freedland, who represents Kah-Orukatan’s and Shortall’s families. Freedland filed a lawsuit against Brito and Weston MedSpa last September; neither have responded to the suit. LAWSUIT: Read the Orukotan lawsuit against Weston Tan & Spa and Omar Brito M.D. The cause of Kah-Orukatan’s death, according to the Florida medical examiner, was “lidocaine toxicity,” an overdose. Sobel, who represents nearby Broward County, plans to reintroduce a bill she introduced last year to regulate so-called med-spas as medical clinics, which would subject them to inspection. The bill didn’t get traction during the Legislature’s last session because it wasn’t a priority of the leadership, Sobel says, adding that “with the increase in the number of deaths, it should be a priority this year.” Sobel also plans to add a requirement that someone trained in anesthesia be present for procedures including liposuction. Even when patients survive, botched surgeries can be painful, disfiguring and costly. Absent regulation, however, any doctor with a license to practice medicine can perform any procedure a patient wants done. Many non-plastic-surgeons have decided to go into areas in which there’s limited oversight, more money and little, if any, interference from insurers because elective cosmetic surgery typically isn’t covered. Plastic surgeons had a higher median income — $270,000 — than 12 of the 22 medical specialties, including emergency and family medicine, in the 2010 Medscape survey by WebMD. The medical field makes a distinction between residency-trained “plastic” surgeons and cosmetic surgeons, but many consumers aren’t aware there’s a difference, says Phil Haeck, a Seattle plastic surgeon who heads the American Society of Plastic Surgeons, the oldest of the industry’s medical groups. 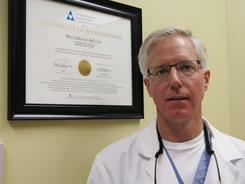 Many of the new cosmetic surgeons are board-certified, just not in plastic surgery, he says. In medicine, board certification occurs when a doctor has met all of the qualifications required by one of the American Board of Medical Specialties’ 24 member boards, which represent the main areas of medicine, including plastic surgery. ABMS sets the standards for the education, lifelong training and testing of doctors. Residencies — the years-long stints working in hospitals under the guidance of more senior physicians — are required for board certification and are the principal distinction separating plastic and cosmetic surgeons, who typically instead do year-long fellowships or private training. Insurers and the accrediting bodies for most hospitals, outpatient surgery clinics and doctors’ operating rooms look for certification by ABMS member boards and typically require doctors to perform only the procedures for which they are board-certified. It’s one of the things that keeps eye doctors from delivering babies and radiologists from treating broken legs. ABMS’ member boards include the American Board of Plastic Surgery but none of the other cosmetic surgery boards, including the similar-sounding American Board of Cosmetic Surgery, that many surgeons say they are certified by. Michael Will, an oral and cosmetic surgeon who is president of the American Board of Cosmetic Surgery, says residencies in plastic surgery are not necessary for doctors — or oral surgeons — who can document their education, experience and training. Michael Will is president of the American Board of Cosmetic Surgery. If they can, “A favorable outcome is certainly possible and likely for the majority of patients,” says Will, who trained in general surgery before doing a cosmetic surgery fellowship. Membership in the American Academy of Cosmetic Surgery increased by 25% during the past five years to 2,600, says AACS President Angelo Cuzalina, an oral surgeon who now does cosmetic surgery full time. Cuzalina says less than 8% of the group’s members are board-certified plastic surgeons. He estimates that 50,000 to 100,000 doctors who aren’t board-certified plastic surgeons are doing cosmetic surgery. Pitches by cosmetic surgeons who aren’t board-certified in the field sometimes tout low prices and say the procedures are safe and easy to bounce back from, a review of advertising and websites shows. Some even offer half-price deals on sites including Groupon. Costs are reduced, in part, when patients are put under local anesthesia rather than intravenous (IV) sedation or general anesthesia. Expenses are much lower when there is no anesthesiologist, hospital or accredited surgical facility. It may be presented as a way to save money, but sometimes it’s the doctors’ only option because their lack of training makes them ineligible to practice in accredited facilities. But Carey Nease, a Chattanooga, Tenn., cosmetic surgeon who is board-certified in facial plastic surgery as well as head and neck surgery, says doctors can be trusted to limit their practices to the procedures they are qualified to do. They can do a fellowship or find training “on their own,” he says. USA TODAY reviewed dozens of photos — most too graphic to publish — and cases involving fatalities and patients with horrific scars and infections after cosmetic treatments by doctors who were not board-certified to practice plastic surgery. These include third-degree burns across the backs and stomachs of laser liposuction victims; implants protruding out of massively infected breasts; and lumps and wounds in liposuction patients that look like the result of stabbings. It’s difficult to analyze or compare the problems caused by non-certified doctors who perform cosmetic surgeries, or even those caused by board-certified plastic surgeons, because doctors are not required to report complications to medical authorities. In addition, states don’t break down deaths by type of doctor involved, and physicians aren’t required to report that they are doing surgeries outside their specialties. In some cases, cosmetic surgeons were trained by other physicians who aren’t board-certified in plastic surgery and who critics say are ill-suited for teaching. Family practitioner Anil Gandhi of Cerritos, Calif., taught himself how to do breast-augmentation surgery after failing eyesight made it impossible for him to do anything other than “superficial” surgery, he said last summer in a deposition reviewed by USA TODAY. Gandhi, who trains other doctors who aren’t plastic surgeons to do cosmetic surgery while patients are awake, said in the deposition that he also does eye lifts, liposuction and tummy tucks. He previously worked as a general surgeon doing procedures including amputations, appendectomies and the treatment of gunshot wounds. The deposition was taken by Pittsburgh attorney Noah Fardo for a case involving a breast-implant patient of OB/GYN Lei Chen, whom Gandhi trained. The woman, Rhonda Stankavich, has “permanent disfigurement” with scars that were three times the typical size and in the wrong locations, according to the lawsuit filed on her behalf. The suit also claimed she felt “significant pain” and was administered three times the recommended safe amount of lidocaine. “I could feel it, and it was almost like he was cutting through gristle on a steak,” Stankavich said in an interview. She says she had the procedure done because she trusted Chen, who was her OB/GYN for more than three years and because his staff said he had done the procedure many times. Instead, she claims in the suit, he was simply “trying plastic surgery.” The case was settled out of court for an undisclosed amount. In a legal response to the lawsuit, an attorney for Chen denied the doctor was negligent. Chen no longer practices medicine in the United States. The Nevada State Board of Medical Examiners filed a formal complaint against another former Gandhi student, family practitioner Sean Su, in September 2009, alleging “substandard care” of several women and “medical malpractice” with one. That patient suffered “considerable anxiety and pain” along with infection after a breast implant was reinserted, the complaint said. Las Vegas plastic surgeon Warren Tracy Hankins says he helped treat the patient at the emergency room. The woman’s breast implant was protruding from her chest even after she had undergone a second procedure to try to sew it back in, he says. A plastic surgeon would have simply removed the implants, he says. “I would consider that torture,” Hankins says. Under a March 2010 settlement of the complaint, the medical examiners board temporarily revoked Su’s medical license but reinstated it as long as he doesn’t practice cosmetic surgery and meets other conditions. Few legislators and regulators appear willing to put up roadblocks to stop doctors trained in other specialties from performing cosmetic surgery. Physicians typically are sanctioned only if they botch the procedures — and get caught. Even then, consumer advocates say, the chances are good that overworked and understaffed state boards of medicine won’t find out if they are breaking the law until it’s too late. California tightened its laws after rapper Kanye West‘s mother, Donda West, died following surgery in 2007 by a plastic surgeon who was not board-certified. The state now requires patients to get a physical exam and written clearance from a doctor before cosmetic surgery. Yolanda Anderson, Donda West’s niece, has been trying to persuade other state legislatures to adopt a version of the Donda West Law. Illinois state Sen. Jacqueline Collins, a Democrat, says she is working with her state’s Department of Financial and Professional Regulation to see how to adapt the law for Illinois and whether it should be expanded, possibly to cover cosmetic procedures in offices and spas, which is where non-plastic-surgeons typically operate. More states, however, have made it easier for those who aren’t plastic surgeons to perform plastic surgery. Sixteen states now allow dentists trained in oral surgery to perform cosmetic surgery on the face, and the New York state legislature is considering a similar bill. New York legislators have been tweaking the laws governing dentists and cosmetic surgery since 2001, according to the National Conference of State Legislatures. The doctors who fight efforts to restrict plastic surgery to those board-certified in the area have told state legislators that the plastic surgeons are only trying to quash competition, says plastic surgeon Miller. Those who do cosmetic surgery but haven’t completed residencies in plastic surgery say they are just as qualified as plastic surgeons and possibly even more so because their training has focused solely on cosmetic work, not reconstruction after injuries or illness. Mark Feldman, an endodontist who is executive director of the New York State Dental Association, says the cosmetic surgery bill is only “a very small part of our advocacy agenda,” which he says mostly involves “things that improve oral health,” such as encouraging the use of fluoride. Letting oral surgeons do eye lifts and nose jobs, he says, would increase competition for consumers. The bill would require oral surgeons to have hospital privileges to do the surgeries at hospitals, though he believes the oral surgeons could be trusted to self-regulate. “I don’t think anyone would do a procedure they wouldn’t feel competent doing,” says Feldman, a former president of the American Dental Association. The debate certainly has the elements of a turf battle. But the plastic surgeons’ position that doctors should practice only in the area they are certified has the backing of ABMS. The Florida Department of Health did take action against Sant Antonio. In an administrative complaint filed in July, the department charged that Sant Antonio attempted to take out far too much fat from Shortall, didn’t have the staff or equipment required by law and didn’t take the steps needed to save her life. It issued an “emergency restriction” on his license that bars him from doing surgery in his office — and he doesn’t have hospital privileges, Florida medical records show. PureLipo, which Sant Antonio trademarked, is a form of “tumescent” liposuction, which means the painkiller is injected along with saline solution and a drug that slows bleeding into small incisions in the skin. PureLipo has been marketed as less invasive than liposuction done by other doctors. However, Miami plastic surgeon Adam Rubinstein says virtually all cosmetic surgeons are doing tumescent liposuction; the main difference is the type of anesthesia used. Doctors who aren’t allowed to offer general anesthesia sometimes have to use a higher level of local anesthesia, he says, which can lead to lidocaine overdoses. Lidocaine is a local anesthetic that decreases pain in the area where it is placed. Too much lidocaine can interfere with brain waves, cause seizures and affect the way the heart pumps, leading to potentially life-threatening problems, says Rubinstein. Liposuction is now the most popular cosmetic surgery procedure in the USA, Cuzalina says. As early as 1999, however, anesthesiologist Rama Rao wrote in the New England Journal of Medicine that tumescent liposuction should be re-evaluated because of deaths, especially from lidocaine. Carol Norton, an OB/GYN in Richardson, Texas, says she branched out into cosmetic procedures “to have a backup plan,” because it’s a “little precarious where insurance is going with reimbursements” for medical care. She started doing Sant Antonio’s PureLipo after taking a three-day course he taught here. A trainer from Sant Antonio’s company then went to her office to observe her first 30 liposuctions. At least 20 other doctors are touting their PureLipo training online. James Howard says his wife was always upbeat yet firm with the kids, making it “difficult to try to grab the reins on her role.” And then there’s the challenge of helping his children understand why she died. At 5-foot-5 and 205 pounds, Kellee Lee-Howard was overweight, but “When you love a person, that transcends over anything physical,” Howard says. Dr.Kjar is a board certified plastic surgeon who is very skilled and has performed thousands of procedures. Be an educated consumer when choosing a plastic surgeon.